Details Pyrolusite is the most common manganese mineral and is an important ore. Its color is variable from iron-black to bluish black to steel gray. 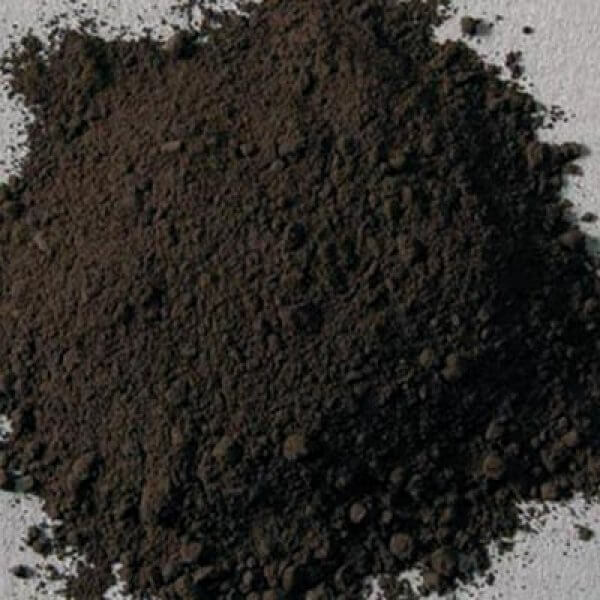 Our pigment is from a dark, brownish black ore from the Ural Mountains, Russia. Manganese oxide minerals have been used for thousands of years by the ancients for making pigments and to clarify glass. Named in 1827 from the Greek for "fire" and "to wash," because it was used to remove brown and green tints in the making of glass. In 1844, pyrolusite was used by LeClaire in Paris to develop a better zinc white for oil. Zinc oxide was ground with poppy oil that was made fast drying by boiling it with pyrolusite. Pyrolusite is an oxidation product of weathered manganese minerals and also forms from stagnant shallow marine and freshwater bog and swamp deposits. The mineral forms tetragonal crystals that are opaque. Usually found as matte-black powdery to fibrous crusts, sometimes in botryoidal aggregates or columnar, more rarely as druses of microscopic prismatic crystals. Minerals such as rhodochrosite, rhodonite and hausmannite are often replaced by pyrolusite. Notable occurrences include deposits in Germany; iron mines in Minnesota and Michigan and at Lake County, New Mexico, USA. Pyrolusite is mined in many countries around the world with the most productive countries being Georgia and Ukraine of the former USSR, India, China, South Africa, Brazil, Australia and Gabon. Our pigment is from a dark, brownish black ore from the Ural Mountains, Russia. 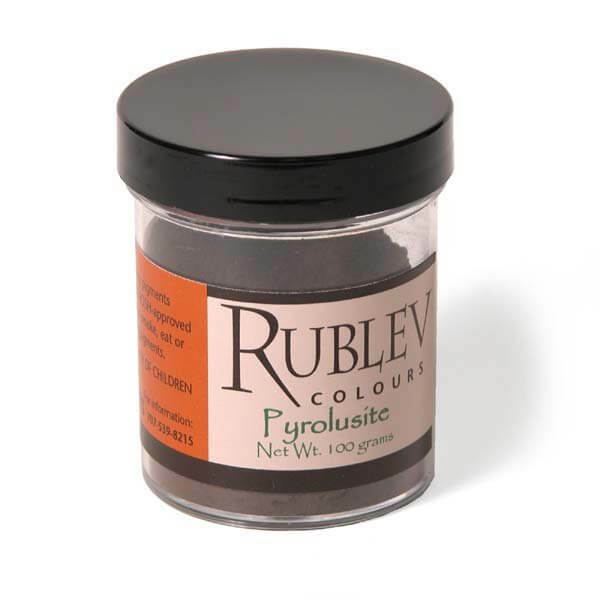 Pyrolusite is a manganese compound and is considered to be among the most permanent pigments in the artist's palette. It can be safely used in all techniques and combines well with all pigments. It is used effectively in all aqueous mediums, such as egg tempera, watercolor and casein. Shungite like its cousins, carbon blacks, absorbs a moderate amount of oil during dispersion, speeds up the drying of oil films, and forms a good flexible film. The oil absorption ratio is 60 parts by weight of pigment to 100 parts by weight of linseed oil. If the measurement were grams, umber would require 100 grams (by weight) of linseed oil to grind 60 grams (by weight) of pigment to form a stiff paste. Pyrolusite is moderately toxic and care should be used in handling the dry powder pigment so as not to inhale the dust.